This is a rectangular United Motor Electrical Service porcelain sign. This particular United Motors Electrical Service sign is white with black and orange print. 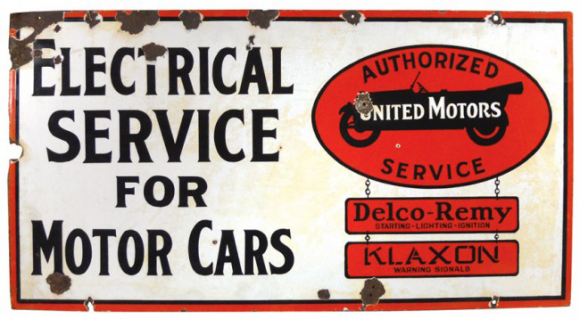 It reads, “Authorized United Motors Service, Delco-Remy Starting, Lighting, Ignition, Klaxon Warning Signals, Electrical Service for Motor Cars” and features an orange United Motors oval on the right side of the sign.